Of the 15.2 million new cases of cancer each year, over 80% of cases will need surgery. The single most important predictor of patient survival for almost all solid cancers is a complete surgical resection. There are unmet clinical needs to develop innovative technologies that can help the surgeon delineate surgical margins and determine if cancer has been completely removed. Although fluorescence-guided surgery has shown promising results for improving the number of complete resections, it requires the injection of a fluorescence contrast agent. Because of cancer heterogeneity, it is unlikely that one universal agent will work for all cancers and all patients. Furthermore, the specificity and delivery of a fluorescence probe to cancer cells can be a challenging problem. Therefore, there is need to develop label-free quantitative imaging technology for objective assessment of cancer margins. The rationale behind HSI technology for cancer detection includes: i) the spectral difference between malignant and benign tissue can be due to the differences in the contents of the cancer microenvironment. Cancerous tissue can have different fluorophores and contains a large number of endogenous biological fluorophores. Common tissue fluorophores include the aromatic amino acids (tryptophan, tyrosine and phenylalanine), the cofactor reduced NADH, flavins, porphyrins, collagen and elastin. NAD+ and NADH differ in their fluorescence and the properties of the fluorescence signal changes when NADH binds to proteins. The changes in fluorescence are used to measure changes in the redox state of living cells through fluorescence microscopy. As inflammation often orchestrates the microenvironment around tumors and causes swelling, any fluid loss or gain can seriously influence the optical properties of the tissue. ii) Malignant and benign cells have different physical properties that cause the changes in relative refraction index and in light scattering in tissue. The shape and organization of the nuclei of cancer cells can be markedly different from that of the nuclei of normal cells of the same origin. Tissue compression and stretching can produce significant changes in optical transmission and scattering. Close packing of malignant cells can cause less scattering due to cooperative effects. Change in blood supplies due to tumor angiogenesis can lead to significant change of tissue optical properties. These biological and physical factors are related to the properties of cancer tissue and will leave distinctive fingerprints in their optical spectra. Cancer margin detection of surgical specimens from a head and neck cancer patient. 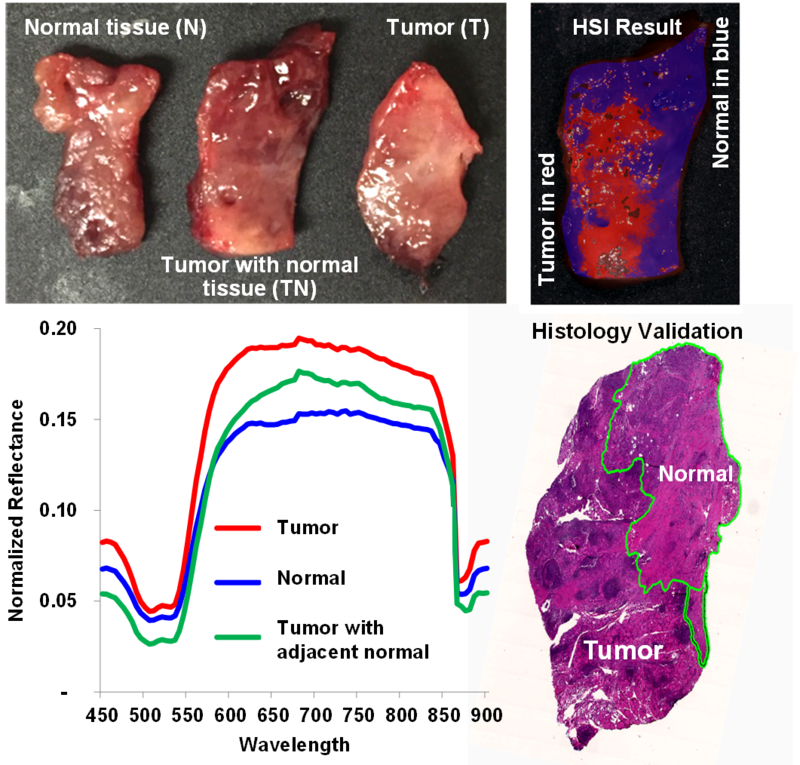 After HSI acquisitions, the tissue were processed histologically and tumor margins were outlined by our pathologist for validating HSI classification (top-right). Note that the histological processing introduced some tissue deformation. The average spectral curves are shown for the tissue.